The varying prices reflect your ability to customize number of jars per month and number of months for the membership. 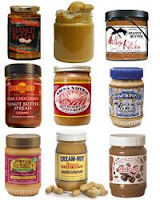 I am fascinated by the idea that there may in fact be enough different exotic peanut butters to fill a year's worth of eating. From the Month Club Store.